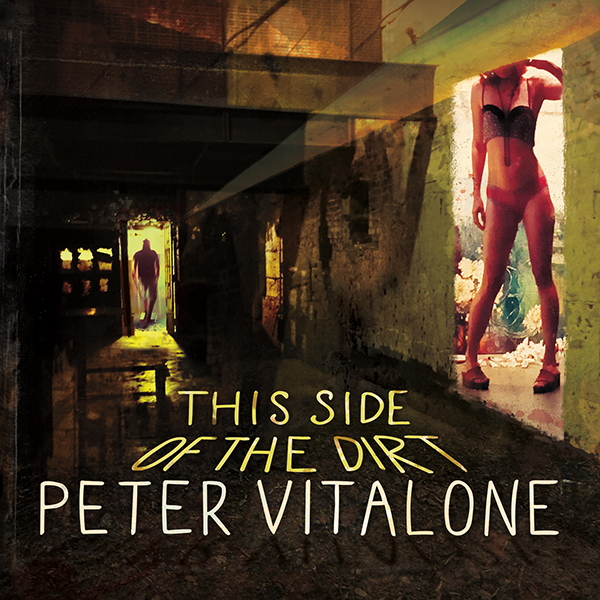 Peter Vitalone‘s voice is interesting. It’s at-times straight-up rock-gravelly, a bit like Bruce Springsteen but with a smoother edge, while sometimes adding more gravel to his voice resulting in a sound reminiscent of Randy Newman channeling Bob Dylan. On the whole, though, it’s rough with round corners, fitting the songs well but not necessarily being instantly identifiable. 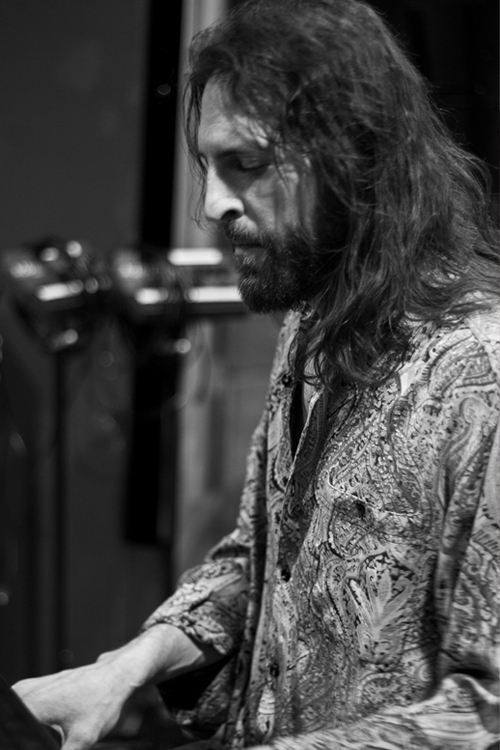 Peter relies on strong songwriting to bring out the best in his versatile voice. Because of its variety of influences, This Side of the Dirt is kind of a difficult mid-tempo, mainstream rock disc to get a read on. The performance is tight. The band is talented. The songwriting is precise. And there’s a cool, classic rock organ line that drives several tracks. So I’ve knew from experience the distinctive elements of the album would reveal themselves over the course of multiple listens. It took a couple dozen listens to develop favorites, since the hooks are subtler and not particularly in-your-face. Typically, that means an album will hold up over months and years and become a longtime favorite, and in that sense I don’t expect This Side of the Dirt to surprise me. Peter kicks the disc off with the energetic “Into Me I See,” his voice’s rough edges summoning the lyrics’ emotion and laying it bare. That leads into “Everyday is Yesterday (Down South),” a laid-back, Jimmy Buffett-esque, feel-good song whose line “shake it up/and pour that bloody mary/’cause everyday is yesterday down south” could be Peter’s “lost shaker of salt” lyric. My favorite track may very well be “Old Friend.” It’s mellow with energetic bridges, rock organ-meets-piano at times. With a bit of a Bruce Hornsby flavor behind its melancholy tone, the song seems both defiant and resigned. Mostly, though, it’s a comfortable “old friend” and a memorable, enjoyable listen. “Man Alone” goes full-on rock organ with some slightly Motown-meets-the-blues-inspired backing vocals; this one might be best absorbed in a black-lit room with a lava lamp. A couple of my other favorites follow “Man Alone.” “In the Morning” has an energetic, folky pop energy. And it flows pleasantly into “Sofia,” a mid-tempo number that recalls ’70s guitar-driven mainstream rock hits. Peter ends the disc with “End of the Line” — a fitting end to the album. It provides just a hint of energy on the heels of its haunting lead-in, “Living on the Ledge.” But “End of the Line” doesn’t bring the tempo up too much. It maintains much of the uneasy balance of its predecessor, as if the song’s footing is still a bit uneasy but less so as it slowly builds, defiantly finding its strength before easing off into the sunset. It leaves the listener with a contented sigh as the last rhythms fade away. Beginning to end, this is a solid disc, a welcome long-term addition to my CD collection. And, if you take a listen, perhaps yours. This entry was posted in Album Reviews and tagged Album Review, Geoff Wilbur, Peter Vitalone. Bookmark the permalink.